I know, I know. I’m behind the times. Shouldn’t this have been written and posted on January 1st? Or even December 31st, to truly finish 2013? Snapped from my window seat (best in the house!) 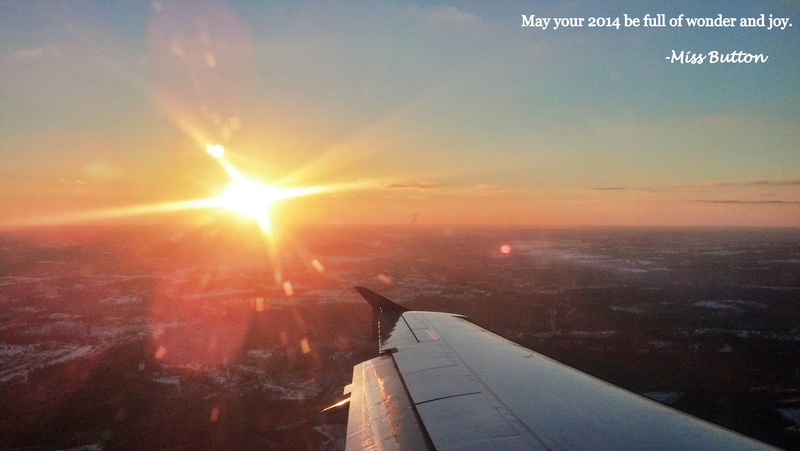 flying into Pennsylvania early January 2014. Beautiful sunset over freshly fallen snow. Not a bad way to start the year. Originally I was going to do some sort of “This is where I was last year and oh, how time flies” post at the end of December. Because, really, a lot has happened: I started 2013 in Istanbul, Turkey, had the best hot chocolate in Croatia, went to Carnival in Slovenia, trekked through a snowy, picturesque Dresden, attended an opera in Prague, and explored Berlin, one of my new favorite cities. I was going to link to all those things, then I realized–I still haven’t written about a bunch of them (although I definitely did a LOT of Instagramming)! But some of the other most exciting things of my life have transpired in 2013, too: I wrote a guidebook on solo female travel for Go! Girl Guides (hopefully to be published very soon! ), started graduate school and moved to a new city (with a very new climate–what’s up, polar vortex!). What’s ahead for Bumblings in 2014? I’ll try to keep posting, although it will probably be as sporadic as it was this fall. My goal is to start working on the backlog of posts–actually working on them–so that at least my Eurotrip stuff will be available and helpful to you all by the summertime. But this will be the first summer in a long time I may not be doing much traveling. It makes me a little sad, because as ready to come home I was last February, that’s been almost a YEAR and I am already itching to delve into new cultures and return to old, familiar ones. BUT, the opportunities coming my way right now are all wonderful and adventures in and of themselves; I plan to take advantage of all of them! On another note, I just wanted to give a warm virtual hug to my city of Tucson today, January 8th, the third anniversary of the shootings that forever changed the fabric of our city and the lives of many people. I am so, so proud to be a native Tucsonan, to share a hometown and alma mater high school with the courageous Gabby Giffords, and to know that there were so many heroes who emerged that day.